In the past few years, there have been numerous stories about the growth of so-called “banking deserts” – that is, areas where American consumers do not have access to branches, and therefore presumably banking services. There have also been allegations that large banks are responsible for a growth in these banking deserts and claims that merger activity among regional banks will further expand them. Moreover, more recently there have also been assertions that branch closures have predominantly occurred in low-and-moderate income (LMI) and minority geographic areas. The share of the U.S. population living in a banking desert – defined as a census tract without access to a branch– is quite low and has been about unchanged in the post-crisis period. LMI consumers are particularly well served by branches, with 99 percent of residents living in low-income areas and 96 percent of residents living in LMI areas covered by a branch. In fact, residents living in LMI geographic areas are more likely to be served by a branch than residents living in the middle- or high-income areas. ­Large banks serve considerably more low-income consumers than small banks. Large banks (those with total assets over $50 billion) serve 96 percent of the population living in low-income areas and 89 percent of the residents living in LMI areas. Indeed, the four largest U.S. banks serve 87 percent of low-income consumers, the same percentage as those served by all small banks combined. Moreover, large banks grew their deposits in low-income, LMI and minority communities two times faster than small banks in the post-crisis period. 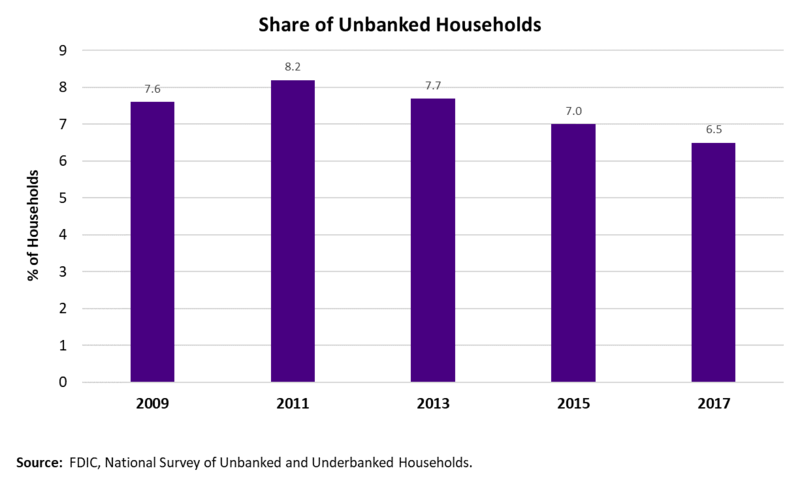 More generally, per FDIC data, the rate of “unbanked” households is currently at an all-time low, and the reduction in the number of branches has had very little impact on the access of the LMI population to banking services. In sum, our results indicate that almost every statement made thus far about banking deserts and on the inclusiveness of the U.S. banking system has been contrary to the observable evidence. In this note we define a banking desert as a geographic area with no bank branch within 2 miles of the center of a census tract in an urban area, within 5 miles in a mixed area or within 10 miles in a rural area. Previous studies define a banking desert as an area with no bank branch within 10 miles of the center of any type of census tract.1 The problem with using the same distance across sparsely- and densely-populated areas is that it assumes it takes the same amount of time to cover a distance of 10 miles in rural and urban areas, which is counterfactual. To address this concern, our analysis is more conservative and assumes shorter distances in more densely-populated areas, which increases the likelihood of finding banking deserts outside rural areas. A census tract is a relatively small geographic region, equivalent to a neighborhood with an average population size of 4,000 people. The location of each branch is defined by a latitude-longitude pair, which is available in the data provided by the FDIC in the Summary of Deposits, an annual survey of branch office deposits. The U.S. census also provides a latitude-longitude pair for the centroid of each census tract, which allows us to calculate the distance between each branch and the center of a census tract. The designations of low- or moderate-income and minority geographic areas are based on the same standards as the ones defined by the Community Reinvestment Act (CRA). A census tract is deemed to be low-income when the median family income in that tract is less than 50 percent of the income of the corresponding metropolitan statistical area (MSA) or metropolitan division (MD). A census tract is considered moderate-income when the median family income is greater than 50 percent but less than 80 percent of the median income of the MSA/MD. The chart above shows the share of the population living in banking deserts using information on the locations of bank branches in 2010 and 2017. Based on our definition of a banking desert, about 5.9 percent of the U.S. population currently lives in a banking desert. The share of the population living in a banking desert is about unchanged between 2010 and 2017. Thus, despite numerous reports in the popular press to the contrary, there has been very little change in the share of the population living in banking deserts. To the contrary, we observe a significant reduction in the share of rural residents living in banking desert over the post-crisis period. 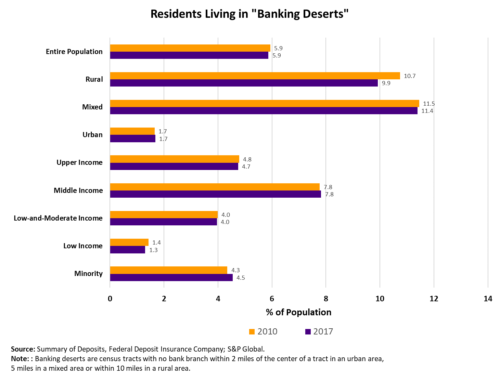 The second significant finding is that residents living in middle- or upper-income geographic areas are more likely to live in a banking desert than residents living in low- or moderate-income geographic areas. About 1.3 percent of residents living in low-income geographic areas do not have a bank branch nearby, while about 7.8 percent of residents living in middle-income are in a banking desert. Thus, it does not appear that census tracts with lower median income are more likely to be in a banking desert. Also notable is that the share of residents living in low-income tracts without a bank branch declined slightly over the post-crisis period. This section shows that large bank branches continue to service almost all residents living in LMI and minority geographic areas despite the decline in the number of branches in the post-crisis period and reports that branch closures have occurred predominantly in LMI geographic areas. Our proximity metric assumes that a branch serves all residents in a census tract if it is within 2 miles of its center in urban areas, within 10 miles of the center of the tract in rural areas and within 5 miles in mixed areas. The chart above shows the coverage of bank branches across selected geographic areas: low-income, LMI, minority and for the entire population. The data on bank branches is based on the latest FDIC release of the summary of deposits, population in each census tract at the end of 2017, and the CRA designations also as of 2017. As shown by the first bar, about 99 percent of the population living in low-income geographic areas and 96 percent of the population living in low- or moderate-income areas are covered by a bank branch. As a subset of this population, large banks (those with more than $50 billion in total assets) cover 96 percent for the population living in low-income areas and 89 percent for the residents living in low- or moderate-income areas. Moreover, the branches of the four largest U.S. banks – JP Morgan, Bank of America, Citi and Wells Fargo – cover 87 percent of the residents living in low-income and 78 percent of the residents living in low- or moderate-income geographic areas. Lastly, banks with less than $50 billion in assets serve 87 percent of low-income residents and 86 percent of the LMI population. So, the four largest banks cover roughly the same low-income population as all banks below $50 billion combined. The coverage of residents living in minority areas by large banks is also quite extensive. In particular, banks above $50 billion in total assets cover 90 percent of the population living in a census tract where the majority of the population belongs to a minority group (i.e., Black, Asian, Hispanic, Asian-Pacific Islander, and/or Native American). The branches of the four largest banks cover 81 percent of residents living in minority areas and the branches of small banks are present in tracts that include 85 percent of residents that belong to a minority group. In terms of the overall population, branches of large banks cover 84 percent of the U.S. population, and the four largest banks cover 70 percent. 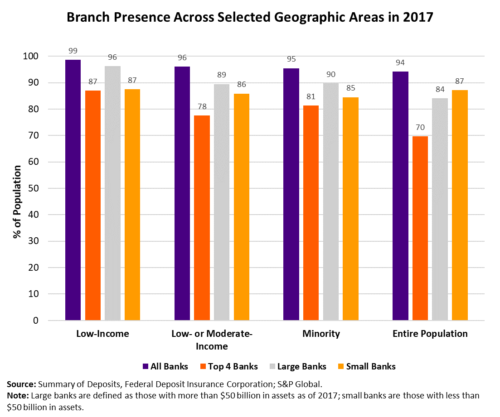 Because these percentages are lower than those observed for LMI and minority populations, residents living in middle- or upper-income areas are farther away from large-bank branches on average. This likely reflects the fact that residents living in LMI and minority geographic areas live in more densely-populated areas. The chart above replicates the analysis using the 2010 release of the Summary of Deposits data, the 2010 population from the census and the corresponding CRA designations. 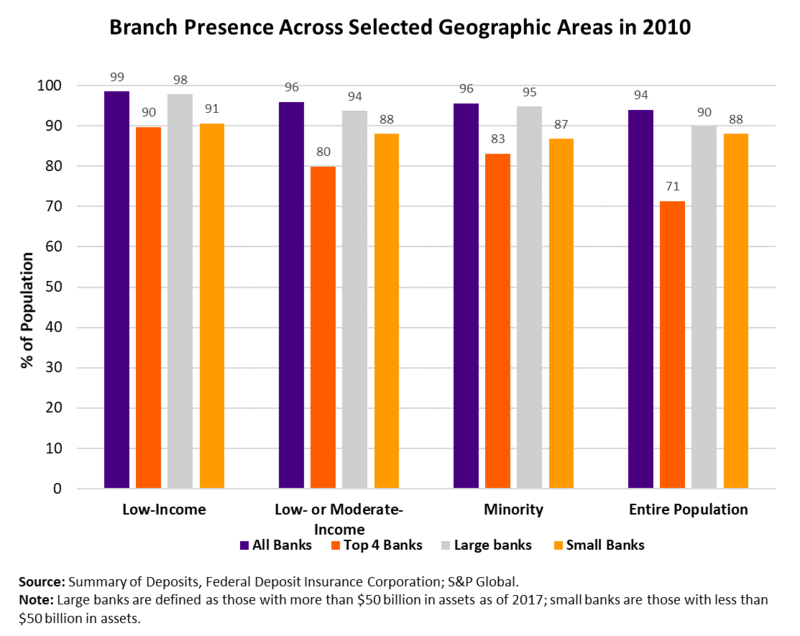 As shown by the purple bars, the presence of bank branches in low-income, LMI and minority populations was about unchanged over the post-crisis period. However, there is a small reduction in the coverage of residents in low-income, LMI and minority areas among the three bank groups. Because those tracts continued to be served by branches owned by other banks, there was no impact in the access to banking services among the residents living in LMI and minority geographic areas between 2010 and 2017. Another way to assess how banks promote financial inclusion is to analyze deposit growth over the post-crisis period at branches that are closest to residents living in low- or moderate-income and minority geographic areas. A very important function of a bank branch is to take deposits from savers living in the community it serves and make loans to borrowers that need the funds to either purchase a home or invest in their own business. It is often the case that banks with a branch presence in a given census tract tend to also lend more in that tract, in part because they are more knowledgeable about the area and use “soft” information to extend credit to borrowers living in that neighborhood. Thus, reports of deposit growth in LMI and majority-minority geographic areas indicate that banks with a presence in those areas are more likely to extend loans in those areas. To more accurately measure the growth rate of just retail deposits, our analysis excludes non-retail branches and those with more than $1 billion in deposits, as those may also include a sizable share of commercial deposits. 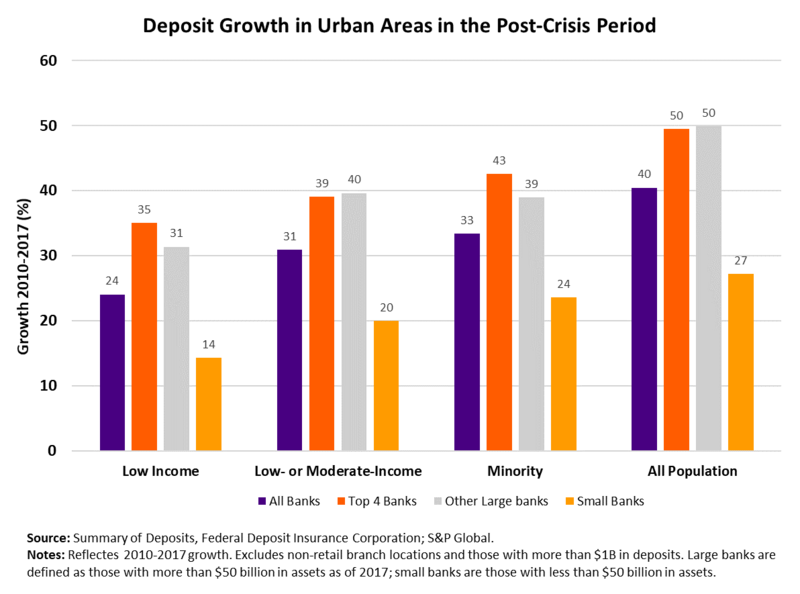 The analysis also focuses on deposit growth in urban areas since about 75 percent of residents living in LMI and minority geographic areas are in urban areas. The chart above depicts deposit growth between 2010 and 2017 at branches closest to residents of low-income, LMI, and minority areas and all urban residents, respectively. The chart also analyzes deposit growth at all banks (purple bars), the largest four banks (orange bars), banks above $50 billion in total assets (grey bars), and banks below $50 billion in assets (yellow bars). As shown in the chart above, deposit growth at branches closest to residents of low-income, LMI and minority tracts in urban areas was faster at branches owned by large banks (grey bars) and at the largest four banks (orange bars) relative to small banks (yellow bars) over the post-crisis period. For instance, deposit growth was about 40 percent at branches servicing residents in low- or moderate-income areas at large banks and just 20 percent at small banks. As we noted in an earlier post, technology (both the ability to gather deposits online, and broader service that will cause depositors to choose large banks, even at lower rates) and demographics (serving faster growing urban areas) are two important advantages that are helping large banks grow deposits at a faster rate relative to small banks in urban areas.2 Deposit growth at branches covering residents in minority geographic areas was also strong at the largest banks. Note that aggregate deposit growth was higher relative to growth registered at branches closest to residents in LMI and minority areas because the growth rate of deposits is highly correlated to income and the analysis focuses on LMI geographic areas. That is, deposit growth in middle-income and upper-income geographic areas was higher than the growth of deposits registered at branches serving low- or moderate-income communities. Even if we had found an increase in the share of the population living in banking deserts, or a reduction in branch coverage of residents living in LMI and minority geographic areas, that would not have necessarily led to an increase in financial exclusion. 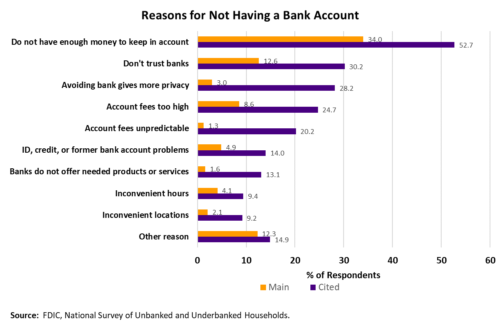 Every two years the Federal Deposit Insurance Corporation publishes a national survey on unbanked and underbanked households to assess the inclusiveness of the U.S. banking system. The survey provides an estimate of the share of the U.S. population that does not have a bank account at an insured bank (“unbanked”) as well as the share of the population with an account at a bank but uses the services of nonbanks to meet their financial needs (“underbanked”). Based on the results of the 2017 survey, the share of households without a bank account declined to 6.5 percent, the lowest level since the start of the survey in 2009. The share of underbanked households, those with one bank account but that have also obtained products or services outside the banking sector, also declined over the post-crisis period. 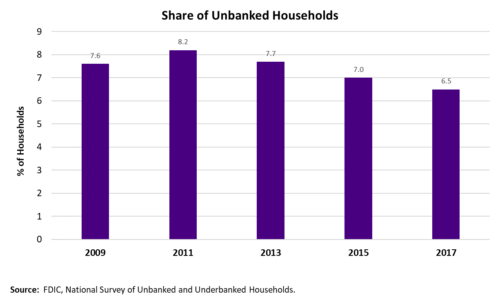 Thus, the slight decrease in the share of the U.S. population living in banking deserts over the post-crisis period is consistent with the decline in the share of unbanked and underbanked households in the FDIC survey. The results in this research note show that almost all of the U.S. population has access to a bank branch and the percentage of residents living in a geographic area without access to a bank branch was little changed over the post-crisis period. We also report that residents living in lower-income and minority geographic areas have better access to bank branches than the rest of the population and accessibility to a bank branch in those communities was also about unchanged over the post-crisis period. Lastly, large banks serve a particularly high percentage of LMI and minority communities and grew their deposits at branches serving those communities two times faster than small banks between 2010 and 2017. See Baer, Greg and Francisco Covas, “Deposit Growth and Occam’s Razor” (March 20, 2019). Available at https://bpi.com/deposit-growth-and-occams-razor. See Morgan, Donald, Maxim Pinkovsky, and Davy Perlman; “The `Banking Desert’ Mirage,” Liberty Street Economics, January 10, 2018.